We had a LOT of trouble finding something that was open and available in Bergen. Our first choice was: Skuteviken Guesthouse which had apartments with kitchens for 900 NOK’s per night. Unfortunately we were not able to get a room there, but the owners really tried to help. They gave us several other places to check but they were already booked as well. We ended up booking at Hotel Park for 1040 NOK’s per night. Shortly after leaving Stavanger we hit our first tunnel. This tunnel is the 5.8 km long Byfjord tunnel. What is amazing about this tunnel is not how long it is but how deep it goes under the water. Once we entered the tunnel, the road drops down at a very steep angle and it seemed like we were going down, down, down. Our ears started popping and soon were at 223 meters (almost 732 feet) below sea level - I believe this is the second-deepest road tunnel in the world (but no worries .... we'll go through THE deepest road tunnel today as well!). It was actually a relief to begin the steep drive back up the tunnel, and to emerge back to the bright sunlight on the island of Sokn. 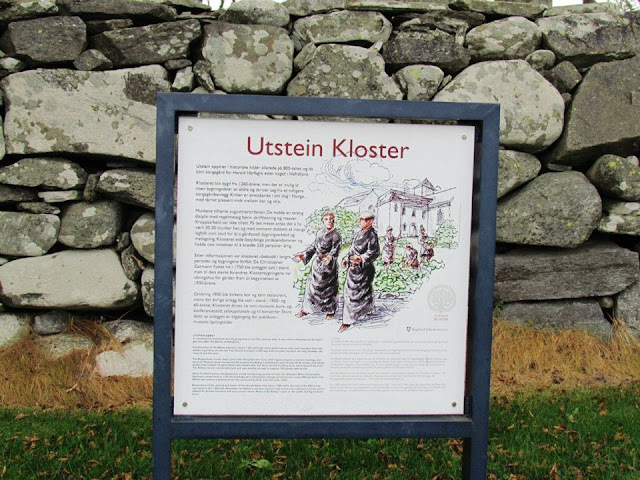 On this trip I thought we might stop at the Utstein Kloster but we decided against it. This was a huge mistake. We have gone since then, and I will be taking our future visitors here as well. It is on the western tip of Mosterøy island and it is one of Norway's finest medieval monuments. This was one of the royal estates of King Harold Fairhair. King Harold Fairhair was the first king to claim sovereignty over all of Norway. Utstein was also the residence for King Magnus Lawmender around the year 1200, and it was later donated to the monks at the St. Olav monastery in Stavanger. They established an Augustinian monastery and carried on with the construction. From the middle of the 18th century, Utstein evolved into a Danish style country manor. Today Utstein Kloster has opened its doors to everyone and classical classical as well as jazz concerts are often held in the chapel. The concerts are performed by top musicians from all over the world. Here is my link to all of our pictures there Utstein Kloster and the link to the Utstein Kloster website. To get to Bergen we need to take 2 ferries. Website is Ferry website . First ferry is Mortavika – Arsvagen. Ferry seems to run every ½ hour. I don't remember exactly how much this ferry cost, but I think it was around 80NOK. After taking this ferry we went through (what we understand to be) the deepest road tunnel in the world. This tunnel is 8 km long and it drops to 260 meters (over 853 feet). Needless to say, our ears were popping just as much on this tunnel and we were very happy to when we started climbing out of it. We decided to take a detour to the Langfassen waterfall in Fjæra. This is called one of the more beautiful cascade waterfalls in the world. 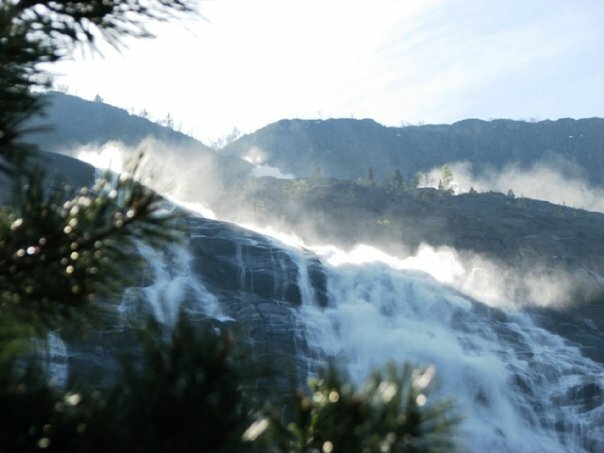 With a width of 250 feet, the river spills over the side of a mountain slope for a length of 2000 feet before it joins the waters of the Åkra Fjord. This is such an awe inspiring sight! I really recommend that if you have a chance, you stop to see it. And then another ferry that goes from Sandvikvag – Halhjem (this one seems to run every ½ hour M-F and every 45 min on the weekends). This ferry ride is almost an hour long. 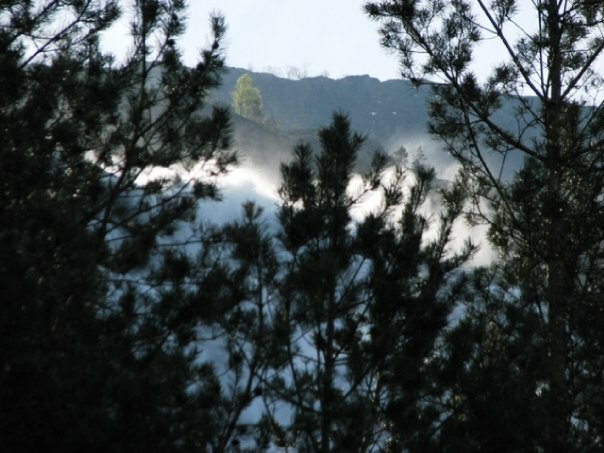 We had thought that we might visit Lysekloster but we spent so much time at the Langfassen waterfall that we ran out of time. It is supposed to be difficult to find and it’s a narrow, winding country road, just wide enough for one car (wonder if that means SUV?). Lyse Kloster was founded in 1146 by bishop Sigurd in Bergen. 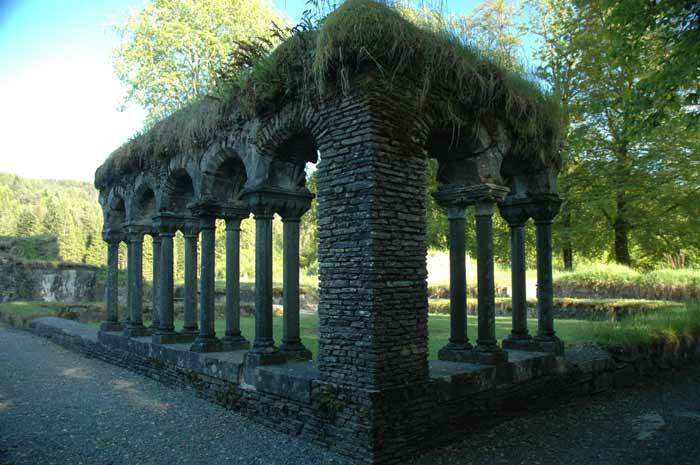 He owned the farm Lyse at Os, and there he built the first Cistercian monastery in Norway. The monastery became big and powerful, and at the time of the Reformation it was one of the most important property in the country. After the Reformation, Lyse Kloster became the property of the Danish King. During the following century a number of owners allowed a gradual destruction of the buildings to take place. Stone from the buildings at Lyse Kloster was used while building The Rosenkrantz Tower in Bergen and Kronborg Castle in Denmark. The ruins are today partly restored, and are the most frequently visited monument at Os.